Nick Jr. is keeping the Rainbow Rangers around. The network just announced they’ve renewed the TV show for a second season. The animated children’s series centers on a group of girls who live in the magical world of Kaleidoscopia. The show debuted its first season in fall 2018. 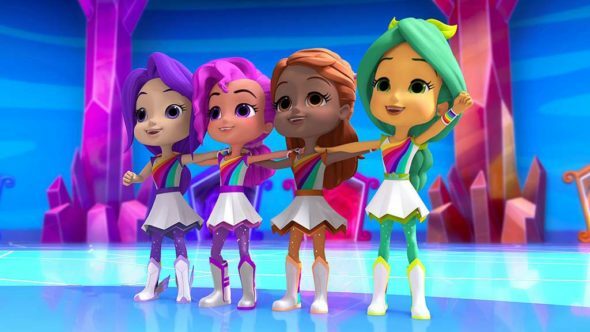 BEVERLY HILLS, Calif., April 08, 2019 (GLOBE NEWSWIRE) — Following the successful premiere of season one of the new animated preschool series, ​Rainbow Rangers​ ​(52 x 11’), airing on the Nick Jr.channel, Genius Brands International “Genius Brands” (Nasdaq:GNUS) announced today the greenlight by Nickelodeon on the production of season two for a full order of 52 x 11-minute episodes. Over 350 Rainbow Ranger product SKUs from over 20 blue-chip, industry-leading manufacturers are coming to the retail marketplace beginning July 2019. Rainbow Rangers anchor categories include toys, publishing, and apparel, led by Mattel Inc. (toy), MacMillan Publishing (publishing), and Bentex (apparel)as well as key licensees in categories, including games, party goods, costumes, bedding, bicycles, scooters, personal care, coloring, activity, boxed role-play, room décor, consumer packaged goods, vitamins, and even a touring show from Gershwin Entertainment. Season two of Rainbow Rangers will bring again the collaboration of one of the strongest creative teams ever assembled for a kid’s animated series, including creators Rob Minkoff (Disney’s The Lion King director), Shane Morris (Disney’s Frozen co-writer), Tim Mansfield and New York Times Bestselling author and Emmy-nominated writer Elise Allen (Dinosaur Train, Lion Guard, Barbie specials), who is serving as head writer and co-creator. Legendary Disney alum Ruben Aquino—responsible for the design and animation of many of Disney’s most iconic characters from award-winning films, including The Lion King, Beauty and the Beast, The Little Mermaid, Mulan, and Frozen—will continue to create key designs. Multi-Emmy Award-winning director Michael Maliani will continue as the director, and Genius Brands’ Chairman and CEO and multiple Emmy-winning producer, Andy Heyward, will continue to serve as executive producer. What do you think? Do your kids watch Rainbow Rangers? Are you glad it’s been renewed? More about: Nick Jr TV shows: canceled or renewed?, Rainbow Rangers, Rainbow Rangers: canceled or renewed?